I have known about this eclipse for about 14 years since joining the Manchester Astronomical Society and the SPA in early 1986 at the time of Halleys Comet. I have been counting down the years for about last ten of those years. I remember often saying to my wife, that we should book early to get accommodation, that was a few years ago. I never did book a holiday, but decided to book a place on an eclipse train organised by Explorers Tours one year ago. The train would set off the evening before the eclipse and return straight after. This seemed the best way to avoid the traffic. August 11th was suddenly very imminent, and I was not prepared at all ! perhaps I was not given enough time to prepare :). I seemed to spend the last few days before the event doing nothing but making solar filters for camera lenses and binoculars, and getting all the various bits of equipment together. 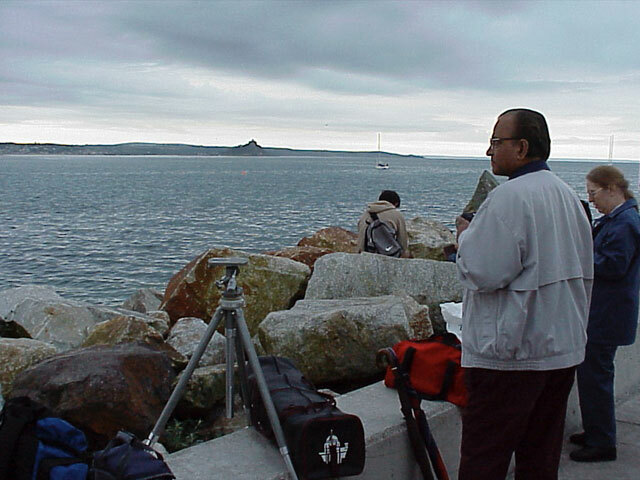 I was going to take a video camera along, but by the time I had my Sony FD91 digital camera, an 800mm fl Tokina telephoto lens with practica camera, tripod, binoculars, plus other bits and pieces. I realised that I would not be able to carry it all, never mind find time to operate all the equipment in the limited time that a total eclipse gives you. To take an image of the Sun during the partial phases with my digital camera every 5 mins. That would enable me to put together an animation of the whole eclipse. At some point during totality I would remove the filter to take a couple of shots. As the digital camera is not of very high resolution I was going to use the 800mm fl Tokina f8 telephoto lens for the totality. This lens has a solar filter fitted, but only to allow me to position and focus the camera before totality. As I was determined to see this eclipse visually this time, (I did not see the partial eclipse of October 12th 1996 because I was too busy sending captured video images to the Internet on the SPA web site) I would also use my 20 x 60mm binoculars also fitted with solar filters, to be taken off at the moment of totality. The weather forecast was not too good, at best I knew the chances of seeing the eclipse was about 40% - 50% but more recent forecasts upto the actual day was a 15% - 20% - very slim indeed. 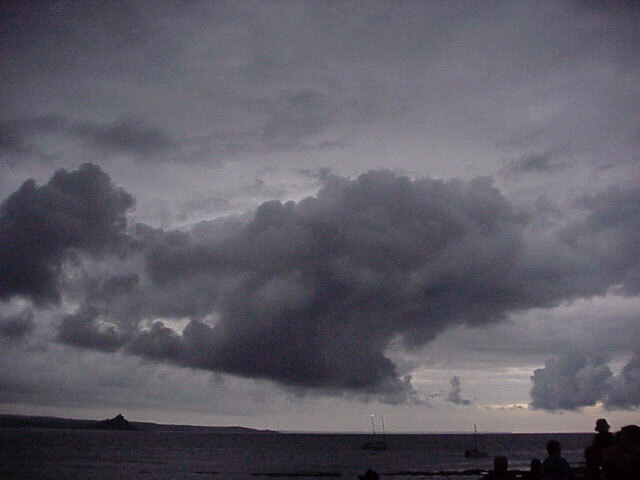 We arrived at Penzance on time after a 12.5 hr train journey. It was still nearly 3 hrs to go before first contact, still, I have waited 14 years, what's was another 3hrs! 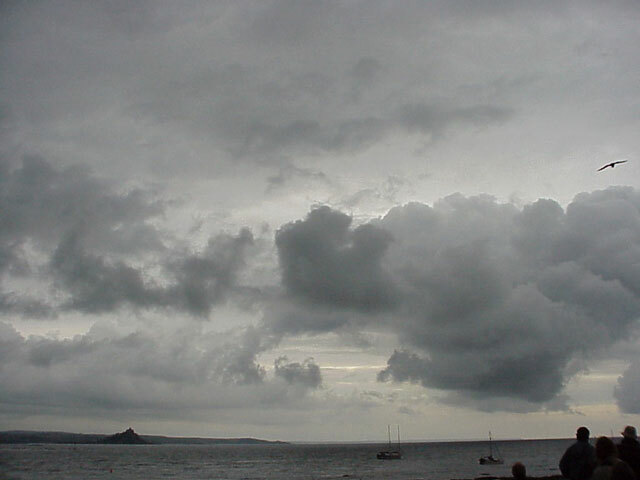 The problem was that it was cloudy, now, why was the weather forecast right this time !!!. 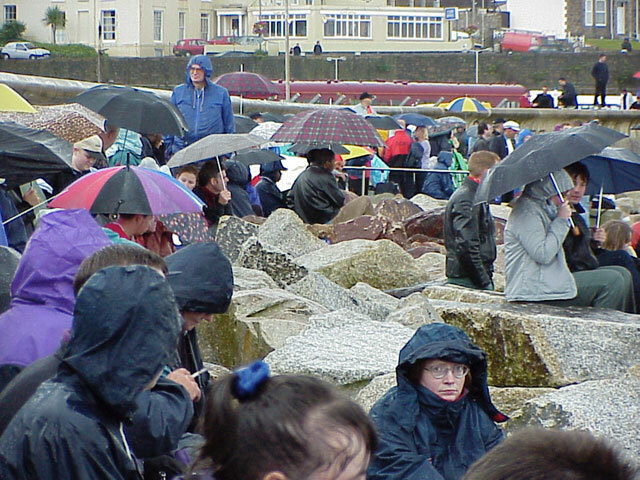 While waiting for the first contact, it started to rain, and boy did it rain. I did not have an umbrella with me, but fellow MAS member Mukti Bhattacharyya allowed me to share his. I had not even thought I would need an umbrella, I had even got some foil to wrap my lenes and cameras in, to keep the heat off the equipment, silly me. The face at bottom right tells it all! First contact came and went unnoticed, it was still raining, and it was looking very unlikely that it would clear, nothing but cloud could be seen. We had a little distraction that kept us amused, a man dressed only in shorts walked out into the sea with a drum, stick and was flinging seeweed in the air. 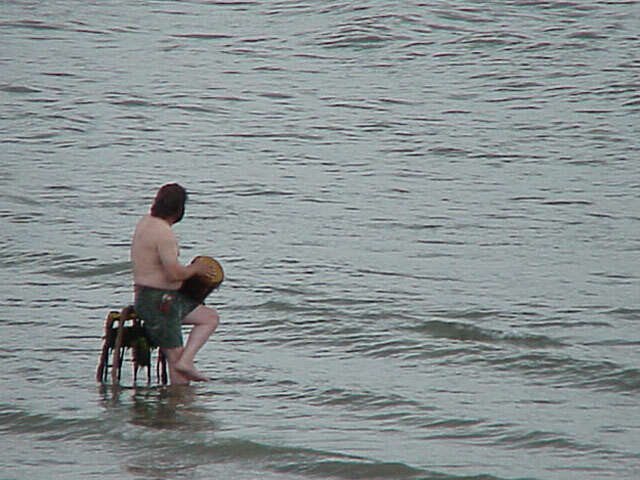 He then proceded to sit on something in the sea and beated his drum, it takes all sorts ! As the time for totality approached the sky was getting darker, slowly at first, it was quite an eerie feeling, it got steadily darker, faster now, the street lights in the area came on. 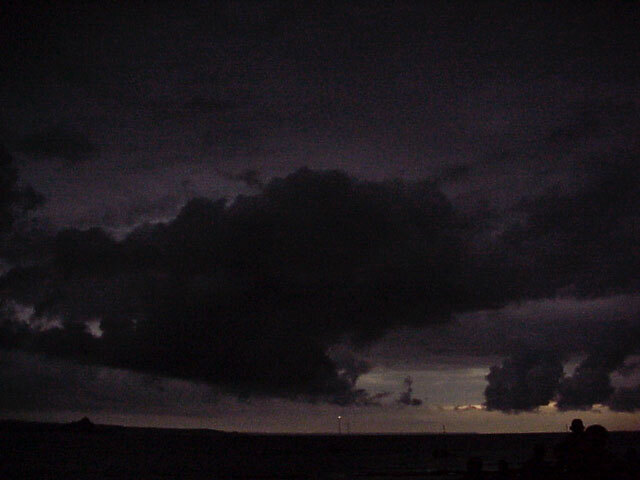 Then just as totality started it went very dark, much darker than I expected. It was just as if night had fallen. The fact that the sky as full of dark rain clouds probably made it seem darker than it really was. The seagulls all simutainiously took fight squawking as they did, this was something of a surprise, I was under the assumption that birds fell silent. Camera flashes could be seen all around and people cheered. 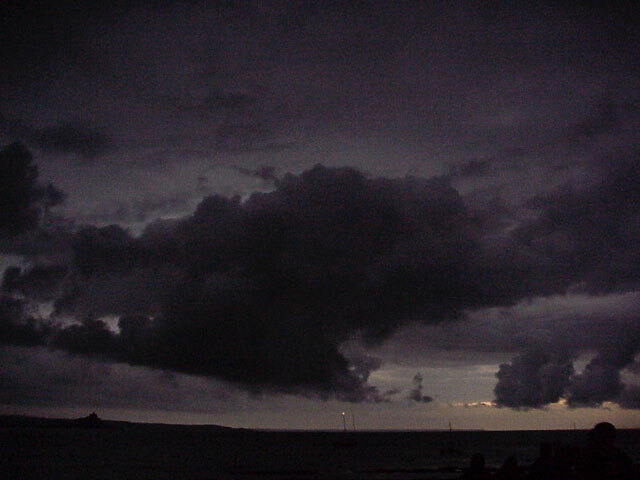 I also noticed that the sea seemed to be more choppy, this may have just been a trick of the light caused by distant street lights, camera flashes glinting on the waves or even the brighter horizon that is not under the shadow. All this and we did not see any of the totality, the whole sky was obscured by cloud. Even so, the event was one not to be missed, and was still quite emotional. I really must see a total eclipse now that I have been through this. 10:05:24 UT Still 5 mins before totality and it's just starting to get darker. 10:06:12 UT 4.5 mins to go and a little darker. 10:09:58 UT 1.5 min and it is getting darker a little faster. 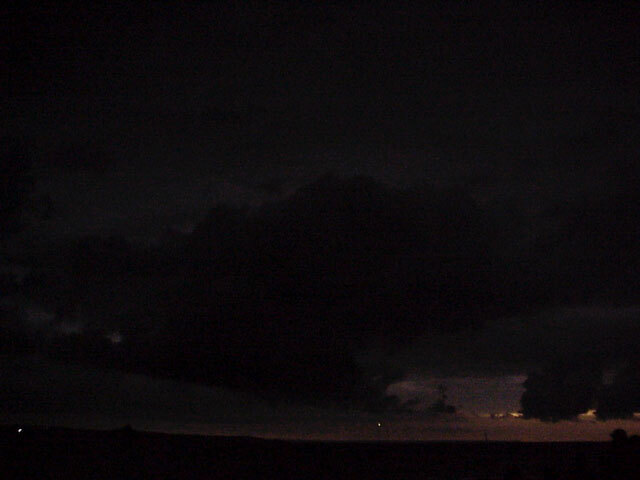 10:10:28 UT 0.5 min and it is getting darker much faster. 10:10:36 UT Just at the start of totality. 10:10:52 UT Half way through totality and it's really quite dark. 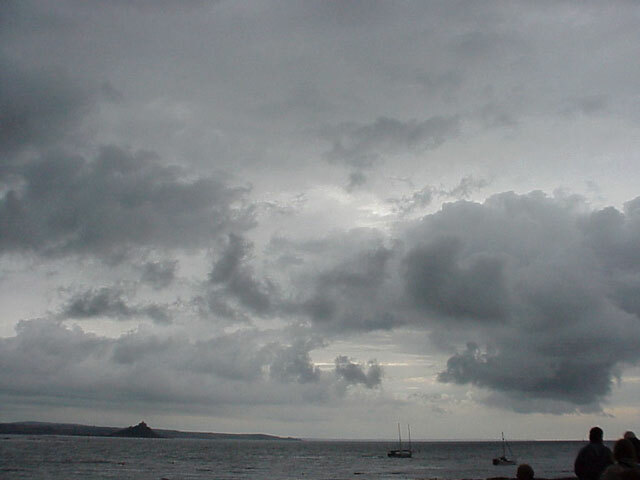 The view is from Penzance looking over the bay to St Michael's Mount. In the last few frames you can see the distant sky is still in sunlight, the area that is not in totality. I still held some hope to see part of the partial phases before 4th contact, but the clouds did not look likely to part. As I was about to eat some lunch in a restaurant, I noticed a sharper shadow through the window, I grabbed my camera and took a few shots of a partial phase (about 30%) through thin cloud. 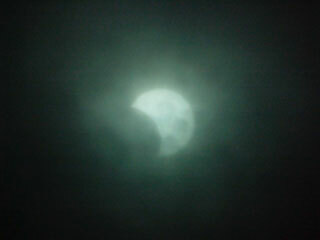 This was to be my only image of the eclipse, at least I had some thing tangible to take home apart from the memories.